Zombies. They seem to be the hottest topic of the decade. The question is no longer, will zombies exist, but when will zombies exist. We seem to know it's coming, so what are we to do about it? It's only a matter of time before the armies of the undead are upon us. At least, that's what TV, movies, comics and video games would have us believe. This Adult Zombie #4 Mask will have you ready for the upcoming apocalypse. It has a gruesome look based on the most frightening of zombies, so you won't just be able to fit in with the rest of the ghouls, they may even make you their leader! 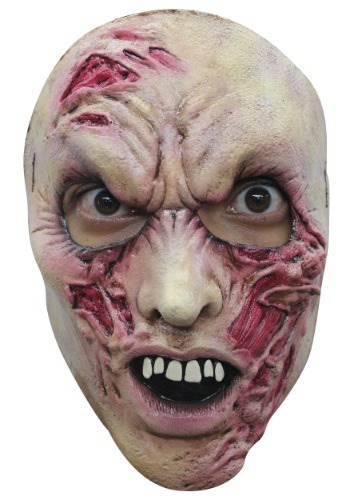 This deluxe mask is perfect for Halloween and is sure to give your neighbors a fright! The mask is made of rubber latex and has an elastic band around the back to keep it securely in place all night long. The mask has eye and nose holes to ensure that you can be comfortable and safe while you are out on the town in your terrifying mask. If you want to get a looks that's both scary and comfortable, then be sure to pick this one up for your Halloween escapades.